Burgess Hill Town suffered a 3-0 away at Leatherhead tonight. Simon Wormull's men were looking to build on their 3-0 win against Merstham on Saturday but two goals from Jeremiah Amoo and one from Shaun Okojie sealed the win for the home side. 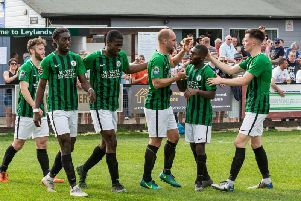 The club tweetd after the game: "A bad night at the office for the Hillians, as @LeatherheadFC run out 3-0 winners in tonight’s @IsthmianLeague fixture. Thank you to all you Hillians who made the journey this evening.